﻿Photo above of J27 (Blackberry) by Sharon Grace, taken from shore 8/26/15. Gov. Jay Inslee’s orca-recovery agenda advancing, but billion-dollar funding yet to be seen​Gov. Jay Inslee’s orca agenda is advancing in the Washington state Legislature, but with the budget yet to be decided how much of the governor’s billion-dollar-bold ambition will be accomplished is yet to be seen. Elders and leaders of the Lummi Nation released a single Chinook salmon into the Salish Sea off western Washington State Wednesday as part of a spiritual ceremony for J17, an orca who showed signs of malnutrition early this year. 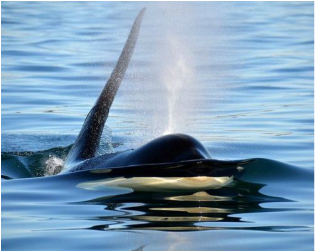 ​SEATTLE -- The southern resident orcas are magnificent, iconic mammals in the Pacific Northwest. They've called these waters home for tens of thousands of years. And then we showed up. ​What do sperm, kids, salmon, and orcas have in common besides that they all swim? All can be harmed by toxic chemicals put in consumer products!